Yesterday I offered to take a new friend on some viewings with me. Viewings can be intimidating, especially at the beginning when you have no clue what the heck you are meant to be looking for. I got really good at looking up, squinting my eyes (no Asian jokes please) and making inquisitive faces at the ceiling. Then I expanded my range and made an inquisitive face at the walls, the flooring, the gutters, the roof tiles. But that’s the only face I had. I was like Derek from Zoolander, I only had one look (One look?!). Must have looked like a right duckhead. Anyway, to look more professional I created a simple viewing sheet checklist which I am going to share with you here –> Viewing sheet. From the checklist, I was then able to calculate rough renovation costs. 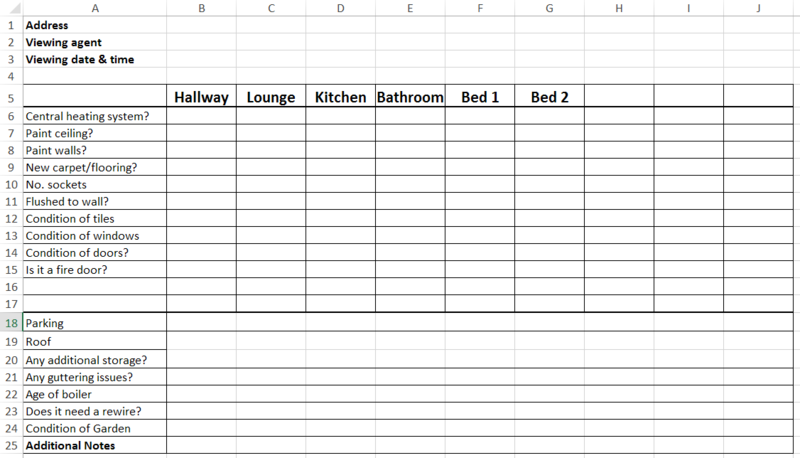 The viewing sheet helped jog my memory of the property once I got home and was doing my calculations. Check out the sheet here. As time goes on you will want to amend it to suit your needs better. I will now guide you through the sheet and explain why I think each point is important. This is based on my subjective experience and what I have learnt so far, so please ask others for their experience too. Central heating system? Does the property have a central heating system? If not, you will not be able to get a normal mortgage. You may have to buy in cash, put a central heating system in and then refinance. OR if you want to play a riskier game, you can exchange with delayed completion, get a key undertaking, put in central heating and then get a mortgage to complete. But if you can’t get a mortgage then you need at least two backup plans. Paint ceiling? This is simple cosmetic repair. You can either ‘tick’ this on your sheet or put an ‘X’ if it doesn’t need painting. It depends on the size of the room but I usually budget £150 to paint a whole room (ceiling + walls) with at least two coats. That includes paint costs, labour and contingency. If you paint yourself, this is obviously a lot cheaper. This cost also assumes you are having other rooms painted in the house. If this is the only room, it will cost you at least two days labour as the paint will need to dry before your decorator does the second coat. Paint walls? Same as above. Although sometimes you may find layers of wallpaper which you will want to remove. If removing causes slight damage to the wall then you will need to re-skim the wall. New carpet/flooring? Does the room need new flooring or carpet? ‘Tick’ for yes, ‘X’ for no. No. of sockets How many plug sockets in the room? This is important to note, especially if you plan on turning the property into an HMO. I would suggest a minimum of two double plug sockets in a bedroom. Ideally on opposite sides of the room. My ideal situation is to have a double plug socket in each corner, for convenience. If you need to add more plug sockets to a room, you need to tell an electrician exactly what you want when you ask him for a quote. Flush to the wall? This is not a huge deal, but plug sockets look much more modern and attractive if they are flush to the wall. If they are not and are sticking out, it is very easy to get this changed. Condition of tiles? Can you use the existing tiles or will you have to re-tile? Condition of windows? Are the single or double glazed? Will they need replacing or can you repaint the edges to freshen them up? New windows are expensive, even the cheapest PVC windows. I recently installed 10 new windows and one composite front door in one of my properties and, including installation it cost around the £5k mark. Condition of doors? Do you need to get new doors to the rooms? You can get decent looking ones for £35. You will also need to buy hinges and pay for labour costs. I budget £80 in total for the door, hinges, contingency and installation. Is it a fire door? If you are doing an HMO you will need to replace all the doors with fire doors. I have not yet had to buy a fire door but they are significantly more expensive than a standard internal plywood door. Have a Google for the different prices. Parking What parking does the property have? Whether you are going to sell the property or rent, it is important there is easy access to parking. This will impact the type of tenant/buyer you get, so make sure that you know your customer and what they need! If there is no parking, make sure the property is close to public transport links. Roof Note down any defects, even if you don’t know what the consequence of them are. E.g. Are there any tiles missing from the roof? How much moss is on there? Any additional storage? Great for you to either keep for yourself, you can rent it out to tenants for an extra fee or use it as an additional selling point. Any guttering issues? Look at the guttering. Is there a lot of muck in it? If so, look at the wall behind the guttering. Is it discoloured? If so the property may have damp issues inside. This is caused by rainwater spilling out of the gutter and onto the external walls of the property. Over time the water penetrates through the brick and causes damp. Don’t worry, you can fix this! You will need to clean the gutters out and then get a builder/handyman to rectify the damp. IMPORTANT NOTE: Look at your neighbours’ gutters too! If they have muck in theirs, it may cause the rain water to still spill onto yours, again causing you the same damp issues. Age of boiler Google says boilers last an average of 15 years. If the boiler is creeping up to that age, bear in mind you will need to replace it soon. I recently replaced a boiler in a 4-bed house and it cost £1,950 replace and install. Does it need a rewire? If you need quite a few of the electrics changing, you may have to rewire the whole house, especially if the wiring is old. Very few electricians feel comfortable amending another electricians work, just in case they get shocked by the poor quality. Ha. Ha. Ha, but seriously. Condition of Garden It’s worth checking the neighbours’ gardens for extensions, or building work that they’ve had approved as then you can assume that it’ll be much easier for you to do the same thing. Additional Notes Great place to make notes on the Vendor’s reason for sale. Awesome. Now you have a few ideas of what to look for you have no excuses. Book three viewings, print off some viewing sheets and see what happens. Also, once you’ve got a better understanding of how the viewing process works, you can use the viewing sheet to help guide less experienced members of your team through property viewings. This will free up your time and you’ll be able to do even more work.